Well, it’s safe to say that this feels like the longest winter EVER. It’s been freezing and just constantly snowing. I took a pic of the house but you can’t even tell where the snow stops and starts since there is so much and it’s so white! I’m thankful for my New Years getaway and the chance to see some lush green, but it has me even more eager for Spring! So, I present, color of the month Feb 2014 Winter Green! I haven't been out thrifting or going to estate sales in quite awhile due to the long winter. 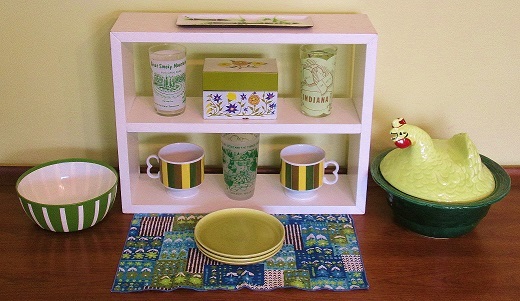 The closet is a little low on new things so here is an eclectic green mix. Fave items:striped Deka bowl, striped mugs, recipe box, state glasses, Goldilocks and the 3 bears glass, and the kitschy chicken casserole dish! 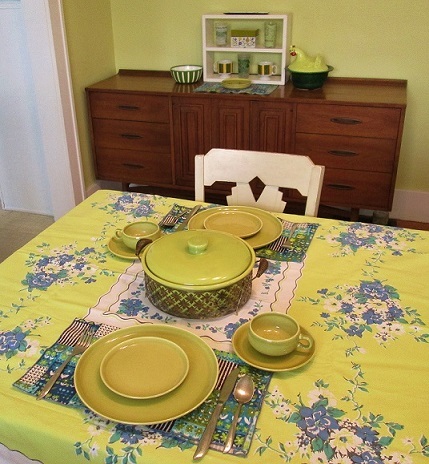 I've been waiting to do a table setting with this awesome vintage tablecloth I added to my collection late summer. Plus, these Russel Wright dishes aren't so bad either! The casserole I picked up was a steal since it has little cracks, but look how gorgeous it is! The fun vintage napkins also make cute place mats!